Well we should all know the Holeproof brand. It came after the Staley name disappeared in the Hosiery game. 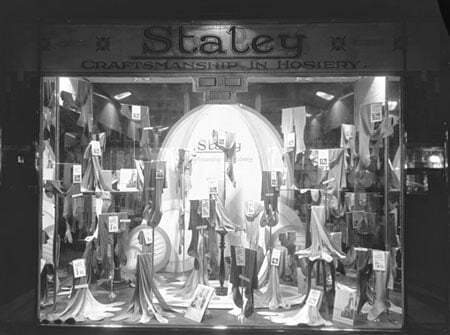 Here’s a picture of a shop, probably from around the 1930’s showing craftsmanship of Staley hosiery. This entry was posted in History on February 12, 2012 by Peter. Free Labourers Arrive at Hay. Free Labourers joining the Unionists. On Wednesday a special meeting of magistrates was convened for the purpose of considering the desirability of reading the Riot Act. The following justices attended:–– Messrs. John Andrew (presiding), A. P. Stewart, A. G. Stevenson, W. H. Barber, W. Travis, N. J. Trevena, and A. Herriott. At this meeting it was unanimously decided that, in apprehension of a riot, one hundred special constables should be sworn in. Steps to carry out that decision were promptly taken. The police magistrate was absent on duty at Booligal, but he returned in the afternoon, and gave in his adherence to what had been done by the honorary magistrates. Accordingly the nomination of a number of special constables was made. In all, one hundred and thirty-three summonses were issued. Some of these were not served, and some of the persons who were served, although liable to a penalty of £20, did not answer to their names. The names of those who obeyed the summons, and were sworn in, are as follows:–– Patrick Abberton, W. A. Parker, W. Dawson, Charles Brown, W. G. Acocks, Joseph Addicoat, B. H. Andrew, M. Armitage, G. R. Ayre, T. W. Blanche, T. C. Booth, John Britton, J. Broad, H. B. Broughton, W. G. Butterworth, F. A. Byrne, E. A. Champ, F. J. Clancy, H. G. Cockerton, E. Cronk, G. D. Devine, John Donaldson, G. H. Donohoe, Thomas Duggan, J. G. R. Fewings, H. Fynmore, R. M. Galloway, F. Gibbs, S. C. Sorenson, R. Gibson, G. Gill, G. Haines, E. J. Heath, Alex. Henry, J. Hews, C. Hidgcock, W. K. Hoare, J. Jacka, O. Jones, John Karnaghan, W. J. Lloyd, G. Lobb, John McFarlane, J. C. Smith, F. L. Phillips, F. MacIver, R. C. McKinney, J. B. McLaren, H. B. Maclure, T. A. Massie, F. A. Meakes, Geo. Meeson, C. J. Miller, Alex. Moffat, A. A. Monypeny, F. E. Morgan, G. S. Mullen, H. A. Jennings, J. Newton, T. S. Page, John Parsons sen., W. Pope, Henry Proctor, L. Quarttert, J. Rawnsley, A. Reid, J. H. Reid, M. Reid, L. S. C. Robertson, W. O. Russell, G. Sadler, John Sandow, Thos. Sinclair, Allen Staley, V. B. Sylvander, Jos. Taylor, sen., Joseph Taylor, jun., P. B. Terry, J. Thacker, W. Thurgood, E. D. Stewart, G. W. Watt, W. Wheeler, Lindsay Whitehead, T. W. Wood, C. W. York, W. E. Woodward, George Bond, J. P. Markey, F. J. Walker, H. R. Broughton, H. Camper, F. L. Phillips, G. Reid, J. C. Smith, A. Turner, John Parsons jun. Allen Staley above, is believed to be Allan William Staley, born 1867, Yandoit. This entry was posted in News on February 8, 2012 by Peter. The internet is a great place to find things out, and we found out the old meanings of the name “Staley”. English: byname from Middle English staley ‘resolute’, ‘reliable’, a reduced form of Stallard. Belgian French: from Old French estalee ‘fish trap’, hence possibly a metonymic occupational name for a fisherman, or topographic name for someone who lived near where fish traps were set. No worries “Staleys” are resolute and reliable, but we’re not aware of any fishermen…. This entry was posted in News on February 2, 2012 by Peter. 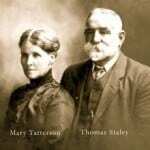 If you’re a regular visitor to the Staley family site, you might have come across problems when the site would not display properly. Well, we hope that it is fixed now. We have moved the site to another hosting site and we’re confident we won’t have any issues going forward. Unfortunately we’re not able to have the Guestbook, but hopefully they’ll be along in a short while. Anyway, we feel it is for the best, which is why we have made this change. This entry was posted in News on May 8, 2011 by Peter. On our “Who is This” page we’ll feature pictures that, we’re not quite sure of who the people in them are. If you’ve got any that you think are something to do with the Staley name we’d love to hear about them. We can feature them, and see if anybody knows anything about them. Also, if you’ve got any Staley pictures, maybe forebears of yourself, that you can let us use in the our photograph galleries, we’d love to hear about them. The pictures we’re showing at the moment are from a small part of the family and we’re confident there are many more out there. If you’ve got them please email them to us and we’ll get them online without delay. This entry was posted in News on February 13, 2011 by Peter.